If you feel silly for looking up how to address save-the-date postcards, don’t. Most people rarely have to think about this more than once in their life. First thing you need to know is that a save-the-date postcard is different from your wedding invitations. A save-the-date card functions more like a pre-invite, and they are usually sent anywhere from 6 months to a year before the actual wedding. The main function of a save-the-date postcard is to allow your guests ample time to clear their calendar and decide whether they can make it to the wedding. Many couples also ask if it’s even necessary to send a save-the-date card in the first place, or if a formal invitation is enough. The answer is yes. It’s recommended that both of these are sent to give guests enough time to prepare, and to give you some slack if some changes are made to your wedding plans. Unlike a wedding invitation, a save-the-date can be sent before the wedding details are finalized, which means you can send them much further in advance. 1. Address the guests with “Mr.,” “Mrs.,” or “Ms.” If you know their professional titles or preferred honorifics, you may use those instead. 2. Write the full names of your guests. 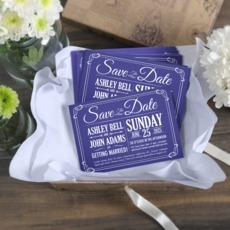 In a formal save-the-date postcard, you may not use nicknames or abbreviations. 3. According to convention, children's names should be added on the second line, immediately after their parents. Children 18 and older should have their own save-the-date. Children under 18 can be included on one card with their parents. 4. Spell out the addresses completely. “Street” and “Road” have to be written out in full instead of “St.” and “Rd.”, and so on. 5. Spell out the city completely. You should however, use proper postal abbreviations for the state. 6. Provide your return address on the postcard, in the upper left-hand corner, about ¼” from the top and left side of the card. In your save-the-date card message, always include the following. 1. The names of the engaged couple. Traditionally the bride-to-be’s name is first. This changes when the couple is married, where the husband’s name will appear first. These days though, you can choose any order you like. 2. Use the words “Save the Date.” You can opt for any other announcement of the engagement. 3. The planned wedding date. You can opt for a target month or week, but this may make it more difficult for your guests. It’s best to have a specific date before you send out your save-the-dates. 4. Wedding location. You don’t have to put down a specific venue at this point, but you should include the country, state, or city if possible.